Tell us about your first years as a professional? I graduated from Beckmans College of Design in 1999. Though I didn’t spend that much time in school during my last semester since I had landed a job at the advertising agency Paradiset, which was the »it« agency at the time. 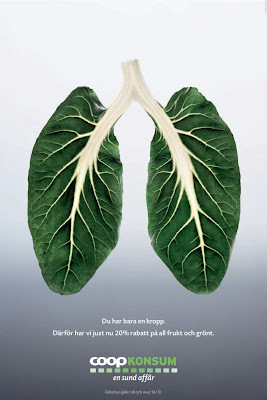 I worked closely with Jocke Jonason for huge international clients like Diesel. Thinking about it now, I am amazed that he gave me so much responsibility from the get-go. I produced photo shoots around the world with some of the greatest photographers at the time. My God, I was so young! Later I understood that to work with all those talented people was a unique experience. Back then I simply thought it was kind of standard, since I had nothing to compare it to. How did your sudden success affect you? I honestly didn’t see it that way. I guess I am not the type to become too self-involved, instead I have a tendency to focus on what went wrong. It may sound kind of depressing but that’s how I work. When I was 25 and everything was moving so fast, that might not have been a bad thing though. People who think that they are great at 25 tend to be pretty hard to work with. 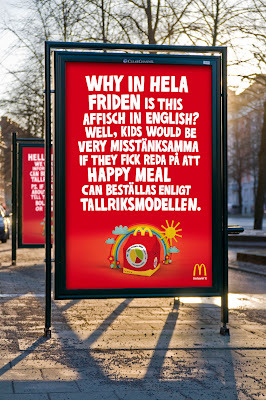 Outdoor campain for Mc Donald’s. What have your goals been? I’ve never had any goals like »I’ll be a partner by the time I’m 30«, but tried to focus on the job at hand. That in turn has given me opportunities such as founding an agency in London with Jocke and becoming a creative director at Lowe Brindfors. It’s important to dare to take the chances that present themselves along the way. I think that’s a good goal in itself, to continue to take chances. It tends to get harder the older we get and that is something to watch out for. Continuing to surprise myself, that’s what I want to do. I am hard on myself and very persistent. I am also good at looking at things from different perspectives, which can be difficult to do while you’re in the middle of a project. I am also equally good at both the idea and the design aspect. Ha, ha. That was a lot of things. You’re a runner and blog about it. Tell us more! Running is something I have always done, only taking time away during my three pregnancies. However, if I had a crazy amount of work to do I didn’t go running as much. Then one day I had a small revelation, I only have this body and that’s it. So I made time to go running no matter how many things that was calling for my attention at work. I decided to train for Stockholm Marathon and five months later I was at the starting line in what was the coldest marathon to date, 4 degrees Celsius and pouring rain. But I did it! I crossed the finish line with the time 3:14:08, which placed me at number 49 among the female runners. I started my blog because I wanted to document all my solitary running sessions. It was great when I realized that others wanted to read about it and I have received so many wonderful e-mails from readers cheering me on. In the book about Janet Froelich that we are working on, she describes a theory she has about women her own age whom didn’t grow up practicing sports and how it affects their careers in a negative way. They lack a certain sports mentality, such as learning to put up goals, handling loss and so on. This is very interesting and something I have thought about myself. I played basketball when I was young: had practice five times a week, games on the weekends and camp in the summer. It has helped form me as a person, to fight for things rather than giving up. You keep going until you’re done, to be part of the race is something you learn. It’s hard and takes energy and you have to know how to handle it without falling apart. 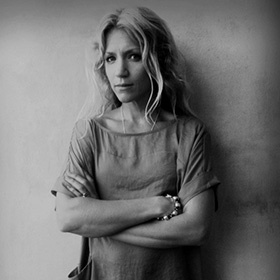 You’re on the board of directors for The Swedish Association of Communication Agencies. 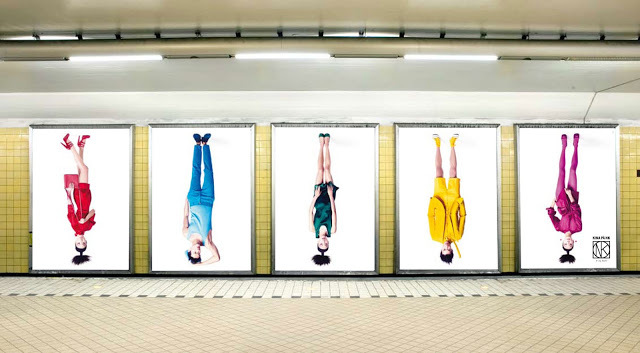 What do you think about equality in the Swedish advertising world? I’m very honored to be on the board and I think they have a clear focus on issues of equality. Things have changed for the past couple of years, many more women are getting noticed today. In the past women tended to disappear once they had children, you see less of that now. Like Janet said about sports, my theory is that a business cannot change because you ask it to. You might have to accept the rules of the game to get in, but once you’re in it’s a little easier to change it. What I mean is that the advertising business is demanding. You have to have a thick skin and not give up because otherwise you tend to fade away. 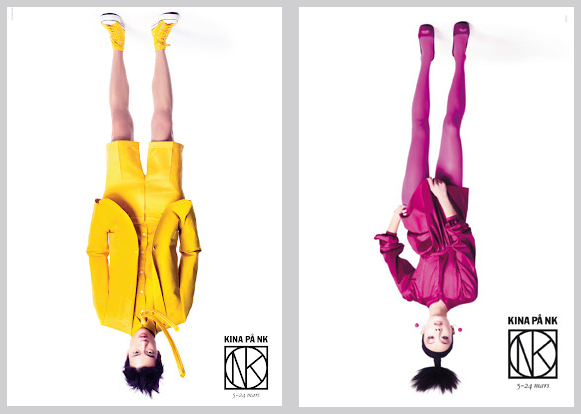 Campain for NK department store, 2008.